Flower Busy is a family business and I (Nicky) have been a qualified local florist for over 10 years. I started off making fresh wedding flowers for brides. I spent a few years creating fabulous and custom designs for brides who wanted something out of the ordinary. This gave me an insight into what brides want and have seen the trends changing in the wedding industry. I then one day had a bride that didn’t want a fresh flower but an artificial bouquet so that she could keep it forever without the expense of having it dried. I did some research and was able to create a beautiful piece. 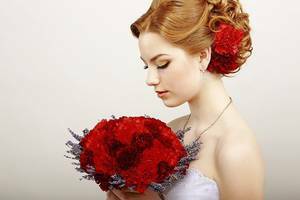 Over the years I discovered that brides who have allergies, or want to take their bouquet abroad, or want to keep their bouquet just as it was on their wedding day was increasing. This has enabled me to create many limitless designs. The beautiful designs that can be created are endless with the vast variety of artificial flowers that are now available. I will endeavor to meet your requirements, please email or text me the design that you would like.